The situation on the cell phones market indicates that mobile communication has really become a mass phenomenon. The countries where the number of users of cell phones exceeds the number of owners of wired phones are getting more. Demand stimulates supply, and the variety of models offered today is 1.5-2 times as much compared to the last year. A cell phone is a conservative thing, and about 70-80% of phones offered on the market today look very similar regarding design and functionality. This is normal. But the phone makers stand idle and they do their best to make you choose their phone and resort to various tricks. As to functionality, it's clear that the more functions, the higher the price; that is why they can only play with design. However, there are different ways as well. A developer can sacrifice functionality for design (Siemens Xelibri line is the best example of such approach) or he can try to balance it. Thus, LG Electronics combined in its G5500 an unusual design and decent functionality. This is a good offer for the image niche where design is very important. The most interesting peculiarity of the G5500 is its sliding design. The phone thus has two active positions, and in every one you can perfectly handle it. Such design is used for the first time. The Nokia 7650 and Siemens SL55 are built on a similar principle, but the aim is different. Nokia and Siemens hide the keypad, while in the G5500 the whole keypad and even the joystick are available in both slider's positions. There are also Samsung Matrix Phone and Nokia 8850, but the former is from a completely different cohort, while the sliding panel in the latter is just a kind of a flip. The last model with a sliding design is the Nokia 8910/8910i. Such an effective solution allows using a large display and rich functionality at the same time. It's clear that a part of the screen is quite enough for voice functions, and if you are going to send SMS or MMS, you can make the the screen larger. In spite of the sliding design (the phone actually consists of two parts) the G5500 is pretty light (80 g) at the dimensions of 94 x 44 x 21.5 mm. Its body is made of plastic with metallic parts to extend its service life. The square design (the side edges are parallel, only the top and bottom surfaces are smoothed) looks attractive, and even the antenna doesn't worsen it. The display in the G5500 is really large: at the resolution of 128 x 160 pixels it houses 6 text lines and 2 service lines. The UFB matrix delivers 65,536 colors, with the image quality being excellent even in the sunny weather - the problem is avoided because the display is a little recessed, which also provides proper functioning of the slider). If you fold it up, the two thirds of the display will be covered by the keypad, exposing only three lines. The keypad design is typical of LG. The keys are pretty large and their shape excellently matches the phone's design; the markings are clear. Above you can see a 5-way joystick (the fifth is the confirmation position), with 4 soft keys around it. On the left side is a double volume control. There are generally more keys compared to an average phone, and it comes in very handy. In the dark you can use the blue backlight. However, if you just need to make a call remember about voice dialling for which there are 10 entries reserved. 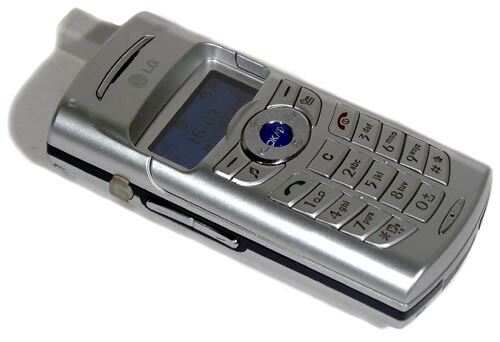 The menu, its structure and appearance are typical of LG phones: there is a column of icons on the right, with an item selected displayed in the middle. The menu goes down when you get into the submenus. Also, you can set digital sequences or assign soft keys or joystick positions for frequently used functions. The suite of logos, screensavers and ring tones looks ascetic, but you can enrich it. Out of 30 high-quality polyphonic ring tones (40-tone polyphony plus vibra alert) 10 can be modified. You can manually type them in with the ring tone editor, transfer by EMS or MMS, or download from the Internet or from PC via a cable or an IR port. The phone supports SMS, EMS and MMS and offers 11 templates and the predicative input (including the Cyrillic symbols). Also, you can create messages up to 980 symbols long, format texts and attach images. The phone connects to PC via an IR port located on the right side, or via a data cable with a COM connector. The Internet can be accessed through the WAP browser 2.0 or the GPRS Class 10 (4+2) protocol. The latter is preferable. The phone book and organizer can be synchronized with PC. The phone book is not that great - you can create up to 200 entries; but it's very convenient - every entry supports up to 6 fields and an image. Besides, the entries can be combined in groups up to 7. In case of an incoming call the display shows both the name and the respective image. The organizer has the whole range of necessary functions, but it also has some limitations. Thus, the number of events in the calendar is limited by 20. The other applications like a calculator, currency and unit converters, alarm clock, a one-minute timer look standard. There are 5 alarm clocks in all, each can be set separately (one time, once a day, once a week). The G5500 also integrates a recorder though one record is limited by 20 sec. You can add some functions using the Java as it's supported in the G5500. But 350 KB is not maximum possible for today (it's dynamically redistributed), though it will be enough for most users. One application can take 60 KB at most. You can load both applications and games. Three games are already installed. Multiply is a clone of tetris, Submarine is an arcade game where you as a captain on a submarine has to evade various obstacles (similar to a game named Cave which was monochrome and lacked sound and was installed on PalmOS computers), and Space Ball - in spite of such name this is just a kind of Snake. The only thing to be mentioned is the Li-Ion battery, 760 mAh, which works about two days at 20-25 minutes of talking a day and moderate usage of other functions. But sometimes the phone ships with a more capacious battery (850 mAh) which prolongs its run-down time and makes the phone heavier (up to 89 g). In all other respects, the LG G5500 is a well balanced solution regarding its functionality combined with a fashionable and unusual look. But it's only the start: the clamshell design has gone to past, while the era of sliding models has only started.